The gallbladder (see the images below) is a relatively small but surgically important organ of the body. Cholecystectomy (open or laparoscopic surgical removal of the gallbladder as a treatment for stones) is one of the most common surgical procedures performed the world over. 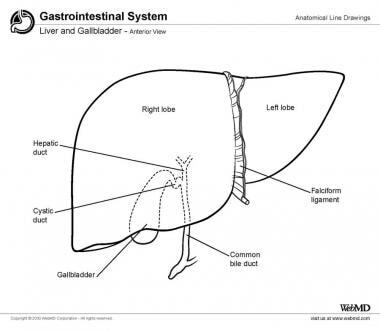 Liver and gallbladder, anterior view. 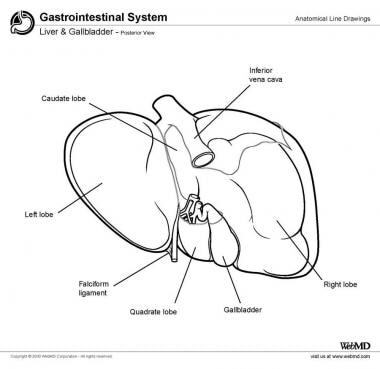 Liver and gallbladder, posterior view. The gallbladder is a piriform (pear-shaped) organ that straddles the undersurface of segments IVB and V of the liver. It has an inferior peritoneal surface and a superior hepatic surface that is closely applied to the gallbladder bed in the liver. The cystic plate is a condensation of fibro-areolar tissue that separates the gallbladder from the liver parenchyma. The cystic plate is well formed in the gallbladder body but gets thinner towards the gallbladder fundus. Small bile ducts may drain from liver parenchyma to the gallbladder through the cystic plate (ducts of Luschka). The part of the gallbladder projecting beyond the undersurface of the liver is called the fundus; fundus continues into the main body of the gallbladder, which lies in a fossa on the undersurface of the liver. The body of the gallbladder narrows into an infundibulum, which leads through the neck to the cystic duct. On computed tomography, the gallbladder neck is seen in higher cuts (sections) than the gallbladder body, which is seen higher than the gallbladder fundus. The cystic duct has spiral folds of mucosa called "valves" of Heister. An inferior sacculation (outpouching) of the gallbladder infundibulum or neck is sometimes present; this is called the Hartmann pouch. The Calot triangle is bounded by the cystic duct on the right, common hepatic duct (CHD) on the left, and undersurface of the liver above; the cystic artery and cystic lymph node of Lund lie in the Calot triangle. A peritoneal cholecystoduodenal fold connects the gallbladder neck to the first part of the duodenum. The lesser omentum runs from the inferior surface of the liver (between the porta hepatis and the umbilical fissure) to the lesser curvature of the stomach and the first part of the duodenum. The free right edge of the lesser omentum is called the hepatoduodenal ligament (HDL). The omental (epiploic) foramen (of Winslow) behind the HDL leads to the lesser sac (omental bursa). The right and left hepatic ducts join outside the liver in its hilum (porta hepatis) to form the common hepatic duct (CHD). The cystic duct joins the CHD to form the bile duct (common bile duct or CBD), which travels downward in the HDL along with the proper hepatic artery to its left and the portal vein behind it. The upper limit of the diameter of the normal CBD is 6-7 mm. The CBD has supraduodenal, retroduodenal (behind the first part of the duodenum), infra-/intraduodenal or retropancreatic (in a groove or sulcus behind or a tunnel through the upper half of the head of the pancreas), and intraduodenal (intramural) parts. The terminal part of the CBD is joined by the terminal part of the pancreatic duct in the pancreatic head to form a common channel (called the hepatopancreatic ampulla when dilated), which runs through the medial duodenal wall and opens on the dome of the greater duodenal papilla, a nipplelike projection on the medial wall of the middle segment of the second part (C loop) of the duodenum. Both ampulla and papilla are eponymously related to Vater. The greater duodenal papilla is covered by a semicircular hoodlike mucosal fold superiorly. A smooth muscle sphincter (of Oddi) is present around the common channel of the CBD and the main pancreatic duct and prevents reflux of duodenal juice into the two ducts. Two other individual smooth muscle sphincters are present around the terminal parts of the CBD (sphincter of Boyden) and the main pancreatic duct before they join; these prevent reflux of pancreatic juice into the CBD and of bile into the main pancreatic duct. The celiac trunk (axis) branches from the anterior surface of the aorta at the level of T12–L1 and divides into the common hepatic artery (CHA), the splenic artery, and the left gastric artery. The CHA runs on the superior border of the proximal body of the pancreas. It gives off the gastroduodenal artery (GDA) and continues as the proper hepatic artery in the HDL to the right of the CBD and in front of the portal vein. The proper hepatic artery then divides into right and left branches. The cystic artery is a branch of the right hepatic artery that is given off behind the CBD; it lies in Calot triangle, where it divides into an anterior and a posterior branch and supplies the gallbladder. The Calot triangle is formed by the undersurface of the liver, the cystic duct, and the common hepatic duct. The cystic artery gives off small branches to the cystic duct as well. It is not an end artery; blood supply comes to the gallbladder from the liver in the gallbladder bed also. No named cystic vein exists; multiple small cholecystohepatic veins drain from the gallbladder into the intrahepatic branches of the portal vein in the liver (segments IV and V) and can result in multiple bilobar liver metastases. Small cholecystic veins may run from the gallbladder neck in the Calot triangle to the main portal vein in the hepatoduodenal ligament. The CBD receives its blood supply from below from the proper hepatic artery, the GDA, the right gastric artery, and the posterior superior pancreaticoduodenal arteries. Subserosal and submucosal lymphatics drain from the gallbladder to the cystic lymph node of Lund along the cystic artery in Calot triangle between the cystic duct and the CHD. Two routes of lymphatic spread have been described from the gallbladder. The main flow is to the right of the HDL (pericholedochal, pancreaticoduodenal, and aortocaval lymph nodes); an alternate route is to the left of the HDL (pericholedochal, hepatic artery, celiac, and para-aortic lymph nodes). The cystic lymph node is not a sentinel lymph node for the gallbladder; gallbladder cancer may spread directly to the lymph nodes in the porta hepatis or the HDL without involvement of the cystic lymph node. Lymph nodes may be present in the HDL or even beyond, even if the cystic lymph node is negative. Subserosal gallbladder lymphatics drain into subcapsular lymphatics in liver. The gallbladder receives parasympathetic nerve supply from the right vagus through its hepatic branch; sympathetic supply comes from T 7-9 through the celiac plexus. The gallbladder wall has the following components: mucosa composed of columnar epithelium that secretes mucus (not bile, which is produced in the liver and is only stored and concentrated in the gallbladder), tunica (lamina) propria, muscularis propria (crisscrossing muscles), subserosa (connective tissue), and serosa (on the inferior peritoneal surface only, not on the superior hepatic surface). The gallbladder has no submucosa. The inner mucosal surface of the gallbladder has multiple polygonal compartments, giving it a honeycomb appearance. Rokitansky-Aschoff sinuses are mucosal outpouchings that go through the muscularis propria into the perimuscular/subserosal tissue. The cystic duct has spiral folds of mucosa (called valves of Heister). The bile duct (common bile duct or CBD) has a fibroelastic wall with no muscle layer except for the submucosal sphincter (of Boyden) around its lower end; it is lined with columnar epithelium, which secretes mucus (this mucus is the ‘white’ bile present in the CBD in patients with surgical obstructive jaundice SOJ). The gallbladder is a reservoir; its size, therefore, changes from time to time depending on the volume of its contents (bile or mucus). A normal gallbladder has a capacity of 30-50 mL but is immensely distensible; an obstructed gallbladder can expand to several times its normal size. If the cystic duct is blocked by a stone or tumor, the gallbladder distends with mucus (not bile) and is called mucocele; in case of a blockage at the lower end of the CBD, for example in pancreatic cancer, the gallbladder distends with bile. Note: Biliary ductal and arterial variants are very common—so common that it is difficult to describe “normal” anatomy. Careful attention to variations of biliary ductal and arterial anatomy is of utmost importance during cholecystectomy to avoid bile duct and vascular injuries. In patients with chronic cholecystitis, the Calot triangle may become fibrosed and obliterated, making dissection difficult. A large stone in the gallbladder infundibulum, neck, or Hartmann pouch may compress the CBD from outside to cause biliary obstruction (Mirizzi syndrome). In later stages, an inflamed Hartmann pouch may become adherent to and may even fistulate into the CBD (cholecysto-choledochal fistula) or the duodenum (cholecysto-duodenal fistula). Small stones in the gallbladder can pass through a wide cystic duct into the CBD and ampulla and cause acute cholangitis and acute pancreatitis. The site of maximum tenderness in acute cholecystitis is the area where the fundus of the gallbladder touches the anterior abdominal wall at the intersection of the ninth costal cartilage and the lateral border of the right rectus muscle. The Calot triangle is the sanctum sanctorum of cholecystectomy. During cholecystectomy, the Calot triangle is dissected first, followed by dissection of the gallbladder from its bed in the liver (retrograde or classic method); sometimes, the fundus is dissected first and then the surgeon moves towards the body and neck to reach the Calot triangle in the end (antegrade or fundus first method). In case of bleeding from the liver during surgery, an index finger may be placed in the omental foramen (of Winslow) and a thumb in front of the hepatoduodenal ligament (HDL), or a vascular or soft noncrushing intestinal clamp may be applied across the HDL to compress the hepatic artery and the portal vein to control/ reduce the bleeding. Ducts of Luschka may result in bile leak and collection, even without an apparent bile duct injury, during cholecystectomy. The valves of Heister may prevent insertion of a catheter through the cystic duct into the common bile duct during intraoperative cholangiography. Agur AMR, Lee MJ, Grant JCB. Grant’s Atlas of Anatomy. 13th Ed. London, UK: Lippincott Williams and Wilkins; 2013. Grant JCB, Basmajian JV, Slonecker CE. Grant's Method of Anatomy. Lewis WH. A Clinical Problem-Solving Approach. 11th Ed. London, UK: Williams and Wilkins; 1989. Gray H. Lewis WH. Gray’s Anatomy of the Human Body. 20th Ed. New York, NY: Bartleby.com; 2000. [Full Text]. Sinnatamby CS. Last's Anatomy: Regional and Applied. 12th Ed. Edinburgh: Churchill Livingstone; 2011.